Report: 3B David Freese has been traded for OF Peter Bourjos, in a four-player deal. Other two players include Cardinals Pitcher Fernando Salas and Angels OF Prospect Randal Grichuk. Not many people remember because of how badly he played in the 2013 MLB season, but he once was the World Series MVP and hero of the St Louis Cardinals. It hasn't been that long since his glory days, hitting 20 home runs and batting in 79 runs with a .292 batting average and .839 OPS, in the 2012 season but he's seemed to lose all his ability in one season, batting .262 with 9 homers and 60 RBI, along with an .721 OPS. His numbers from the 2012-13 season to the 2013-14 season took a drastic hit. David Freese performed horribly in the Cardinals 2013 World Series run, batting .179 with a home run and 4 RBI. Maybe if Freese hadn't of been so off, the outcome perhaps would have been different. The reason why St Louis wanted to trade David Freese before the 2014 season, was because with Kolten Wong finally in the Major League's for the whole season, Matt Carpenter can shift back to Third Base and Wong plays Second. I'd much rather have Carpenter and Wong, than Carpenter and Freese. 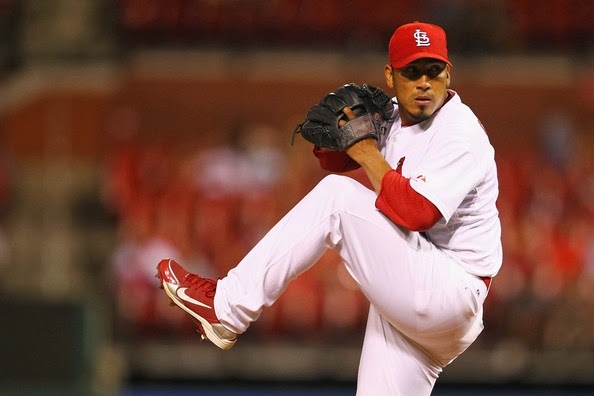 Fernando Salas has been a so-so pitcher throughout his career and that isn't about to change. He has three pitches and has to throw strikes to be effective and can't be otherwise. Like his career, Salas had an average season pitching out of the bullpen, with a 4.50 ERA in 28.0 innings pitched. However, the Angels were in dire need for some help in the bullpen, as they had a bullpen that ranked in the bottom-half of the MLB. The Cardinals are one of the smartest organizations in baseball, if not the smartest, so if they think it was the time to let go of their beloved hometown hero and a solid arm, then I suggest you don't doubt them. 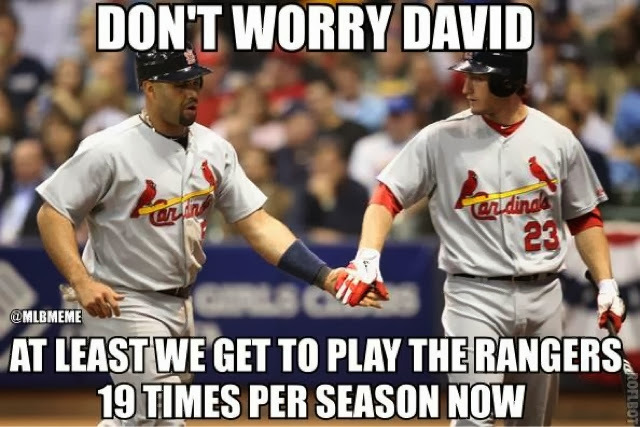 Especially if you consider what they got in return for Salas and Freese. In the 2013 World Series, the Cardinals played atrocious defense in the outfield and that was mostly because of CF Jon Jay. That is where Peter Bourjos comes into factor. He may not be as good a hitter as Jon Jay but he is a much better defender than him. Since the Cards are such a great hitting team anyways, Bourjos won't be relied on to do much on the offensive end, considering how he is at the plate. Jon Jay is most likely gone after this season, whether it's for Peter Bourjos or the top prospect in their farm system, Oscar Tavares. If that's the case, then Bourjos is going to be looking at the same situation he had for the Angels. Like Bourjos, Randal Grichuk is an astounding defensive player, winning the Minor League Rawlings Gold Glove Award for the 2013 season. As stellar he is defensively, he doesn't have an arm strong enough for playing CF se he's stuck to playing either corner outfield spot. The Cardinals may have just gotten a steal in Randal Grichuk and are glad to have him in their already plentiful farm-system. He has all the tools and ability to be an impact player on arrival. Peter Bourjos was brought in in the 2011 season, being endorsed as the starting CF. As it turned out, Bourjos got the job and played well, hitting 12 home runs, 11 triples and for a .272 batting average, along with an OPS of .765 and swiping 22 bases. Unfortunately for him, his anticipated sophomore season after a promising rookie season, was screwed because of the uprising of Mike Trout, which was fortunate for the Angels. Ever since then, he's been spot-starting and mainly been the 3rd or 4th outfielder for Los Angeles and that's seriously impacted his development. Even with all the obstacles, Bourjos is still a superb defender and that makes up for his hitting, unlike David Freese, who is a putrid defender at best. This is a classic case of wrong place at the wrong time, or in this case, team. It's been known for awhile now that the Angels are trying to shop Peter Bourjos and they've finally succeeded in doing that. 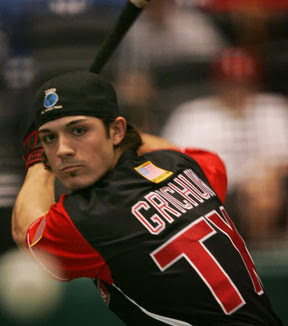 Randal Grichuk has been a fringe OF prospect, meaning he's been on the cusp of playing in the MLB hut hasn't yet, after getting drafted by the Angels with the 24th pick of the 2009 MLB Draft. He's progressed through the minors through the years, going from Double-A to Triple-A, unfortunately being unable to adjust to the harder pitcher. Even though Grichuk is not a sound hitter, his defense is great for his age, as he won a Minor League Rawlings Gold Glove. 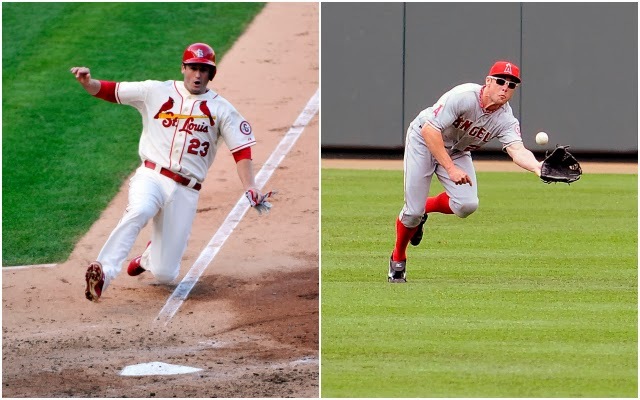 Grichuk is like Bourjos, except minus the speed and add more power. Grichuk has the potential to become a stellar pro in his career. 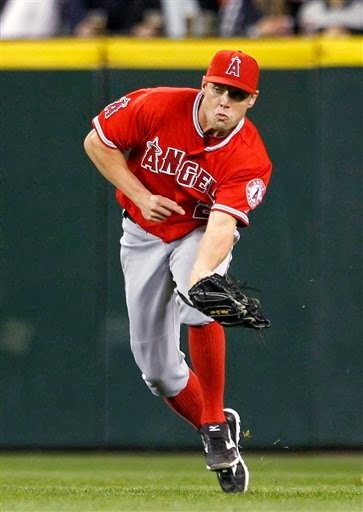 Like their bullpen, the Los Angeles Angels were desperate for a solid starting Third Baseman - they played seven different Third Basemen over the course of the 2013 regular season, with no player in particular standing out , since trading Alberto Collapso to the Oakland Athletics in the middle of the season. Fortunately, it seems as if the Angels have found their answer in David Freese, at least for the immediate future. Freese is an obvious upgrade over his counterparts that include the likes of Chris Nelson, Luis Jimenez and Andrew Romine. If David Freese can stay healthy and go back to his 2012 season numbers, and that's a big if, this trade was worth it. However, it is highly unlikely, considering Freese's past injury history. The Los Angeles Angels have one of the most expensive team budget's in all of baseball and most of it is spent on their hitters, who have produced. Unfortunately, their pitching staff and bullpen lack in talent and success. That's where Fernando Salas comes into play. Now, Salas isn't the "answer", but he's certainly a start. Salas has shown potential in the past that he can play well as a closer, going 24 for 30 in save chances, with an ERA of 2.28 in 2011 but his recent season performances suggests otherwise. Expect him to be solid. Why? Simple; with Jon Jay most likely going to be gone and with Kolten Wong playing his first full season as a Cardinal, to keep David Freese makes no sense, especially considering how injury prone and inconsistent he is. Also, the Cards may have gotten a steal of a prospect that so many people have been dumb enough to miss. In a year or so, the St Louis Cardinals are going to make the Los Angeles Angels regret doing this trade. Good breakdown. 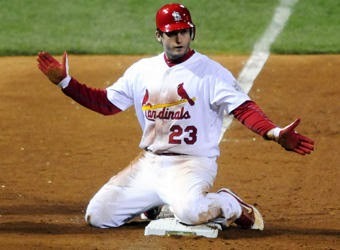 As a Cardinals fan, I will miss Freese, but it was time to move on. The Cardinals did a great job of getting good value for Freese and the team can now shift Matt Carpenter back to his natural position of third base and utilize prospect Kolten Wong at second. Defense is improved greatly. I'm one too, I was one of his biggest fans and still am but like you said, it was time to move on. Defense was our achilles heel in the World Series and it looks like we have that fixed.